● Robust home sales are dependent upon consumer confidence in the economy. Consumers must feel that both their personal economy as well as that of the nation is on sound footing before committing to such a major, long-term purchase, especially on the heels of the longest recession in more than half a century. Thus far, consumers are far from confident. ● A vigorous recovery of the housing market cannot occur as long as we have unusually high unemployment. While there is much disagreement on when and how our recovery will occur, the financial experts all agree that unemployment will remain at higher than normal levels for several years, and some projections do not indicate a recovery to “full” employment for as much as ten years. With at least 20 million unemployed or underemployed, and with awareness that many of the jobs lost will never return, a high rate of joblessness could possibly become the norm. ● The dramatic loss of home equity will significantly limit the pool of available move-up buyers. In the past, move-up buyers used the equity from their former home to help them purchase a larger/more expensive one; however, declining home values with the associated loss of trillions in equity means fewer sellers will have the resources to purchase another home. ● A continued high rate of foreclosures will depress both the housing market and the hopes of many potential buyers. The millions who have experienced foreclosure will be automatically ousted from the buying pool. For some, several years of damage to their credit rating will be the defining factor; and others will become permanent renters, avoiding the potential for further pain and the trauma associated with foreclosure. ● A slow increase in mortgage rates will reduce the number of qualified buyers. As we experience the higher mortgage payments associated with rising interest rates, many will fail to qualify for loans on the homes of their choice. Others, having been “spoiled” by the low rates of the past decade, will stay out of the market hoping for a return to those rates. ● Tighter lending restrictions will also result in fewer buyers qualifying for home loans. And the restrictions, combined with the declines in credit scores experienced by millions of consumers will only further reduce the number of buyers. Additionally, there are other factors such as: high levels of consumer debt, changing demographics, and a diminishing of the appeal of home ownership as a result of experiences during the current recession, will only serve to dramatically alter the housing market for the foreseeable future. While there will always be a group committed to home ownership and will always be homes available for them to purchase, an expectation that the housing market will soon recoup its losses and regain its momentum, for me, seems extremely unlikely. Can you believe that more snow is falling? It is beautiful...but enough is enough! It's comforting to know that under all that snow blanketing the ground are the first daffodil buds. Don't miss Children's Theatre of Cincinnati's latest presentation at Taft Theatre this weekend...Jack and the Beanstalk. If you remember, the traditional folk tale features Jack who trades his cow for five magic beans, much to his mother's dismay. But, these beans are indeed magic and Jack subsequently meets the Giant. Founded over 80 years ago as a project of the Junior League of Cincinnati, the Children's Theatre has lived on in the hearts of children, both young and old, throughout that time. The organization aims to bring the magic of theater to children ages 4 and up. They produce four plays each year, performing during the week for student groups and on the weekend for the general public. For every show they produce, a study guide is designed to help students question the values taught in the show and assist learning before and after the show. You will find the study guide on their website and might enjoy using it with your children. The shows will be performed on Friday night 2/26 at 7:30 pm, Saturday, 2/27 at 2 pm and 5 pm and Sunday, 2/28 at 2 pm. On Saturday 3/6 they will perform at 2 pm. Tickets can be purchased for as little as $7. FHA's New Financing Rules Pinch Home Buyers and May Reduce the Buyer Pool. Changes to mortgage underwriting dictated by FHA will make it harder for households to secure affordable home financing. FHA announced that these changes need to be made to shore up the FHA's capital reserves and help the agency do a better job of managing risk. The value of the FHA's reserves to cover losses (that means BAD LOANS) has fallen to $3.6 billion, about 0.5% of the $685 billion in loans outstanding, down from 3% a year earlier. Congress requires the agency to maintain a 2% capital-reserve ratio. Since the beginning of the economic downturn, an increasing number of borrowers have needed to use FHA loans in order to purchase a home. These loans currently require 3.5% down payment plus closing costs and mortgage insurance. However, it is the lowest cost alternative for those who have little down payment...the old 100% loans are simply no longer available. FHA will require riskier borrowers with credit scores below 580 to make a minimum 10% down payment. While the FHA doesn't have a credit-score cutoff, most lenders require a minimum 600-620 score. This change is expected to go into effect in the early summer. Higher credit scores and down payment = fewer buyers. FHA will reduce the amount of money that sellers can kick in for closing costs to 3% of the sale price, down from the current level of 6%. This change is also expected to go into affect in early summer. Reducing seller concessions = fewer buyers. HUD will also monitor lender performance and compliance with FHA guidelines and standards. This increased surveillance and enforcement will look at default rates as well. Fear of making loans = fewer buyers. Believe it or not, FHA makes nearly 40% of all loans made today. It is important to keep this option available to borrowers, but in this tight market, we all worry that the additional down payment needed will deny home ownership to many prospective buyers and further damage the housing industry. This picture, taken at Ivy Hills Country Club in Anderson Township, just struck me as funny. No gentlemen, I don't think they mean that this is where to drop your "old bag!" Have faith, Spring is on its way! Once again Cincinnati has been rated by Central Connecticut State University as a highly literate city. The ninth place ranking is attributable to the combination of local library resources, number of bookstores, Internet resources and educational attainment. The study speculates that the combination of Fortune 500 companies, the thriving arts community and density of colleges and universities and hospitals all create a core population that values books and the written word. Did you know that Cincinnati is tied for third nationally for the number of booksellers per 10,000 residents? Plus, the Hamilton county voters showed their belief in the value of books when they supported the tax levy to maintain services at the Public Library of Cincinnati and Hamilton county. Both of these statistics add to Cincinnati's clout. Seattle, Washington, D.C., Minneapolis and Boston all ranked ahead of Cincinnati. Existing home sales are up in 2010 compared to the same time a year ago. According to the National Association of REALTORS (NAR), existing homes sales -- including single family, condominiums, townhomes and co-ops -- were up 11.5 percent from January 2009 levels. At the current pace, NAR is projecting existing home sales of 5.05 million units for the year. Total housing inventory is down 0.5 percent to 3.27 million units nationally. NAR chief economist Lawrence Yun is watching the sales data very closely. "Activity should be picking up strongly in late spring as buyers take advantage of the tax credit, which is critical to absorb distressed properties reaching the market and to continually chip away at inventory," Yun said. 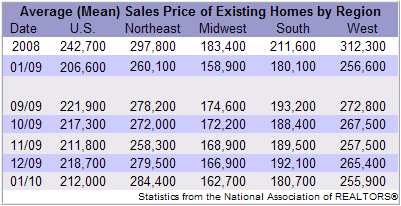 "With a downtrend in the number of homes on the market, especially in the lower price ranges, values are beginning to firm but with great variance around the country." Mortgage backer Freddie Mac reported an average commitment rate for a 30-year, conventional, fixed-rate mortgage of 5.03 percent in January. This is up slightly from 4.93 percent available in December 2009, but down overall from a year ago when the rate was 5.05 percent in January 2009. Billing itself as the place to spend time with your family, the home-style atmosphere at the Cincinnati Family Enrichment Center helps everyone relax from their busy lifestyles. In their old, Northside mansion, there are multiple classes for all ages and even informal Friday night get togethers. The Cincinnati Family Enrichment Center has classes for infants (Tummy Time, Baby Yoga, Time Out Together, Jammin' in our Jammies), for families (interactive story time, Wiggle Worms, Spanish for the family), and for parents (Mom encouragement, pregnancy celebration). Wellness classes include pediatric massage, CranioSacral therapy, baby reflexology and pampering of Mom. Winter is a great time to experience these indoor activities. The Best of Cincinnati named them the Best Place for Families!